This is version 1 2 3 4 5 6 7 8 9 10 11 12 13 14 15 16 17 18 19 20 21 22 23 24 25 26 27 28 29 30 31 32 33 34 35 36 37 38 39 40 41 42 43 44 45 . It is not the current version, and thus it cannot be edited. CrushFTP 5 is a separate install. Download a fresh copy of CrushFTP 5. 1.) 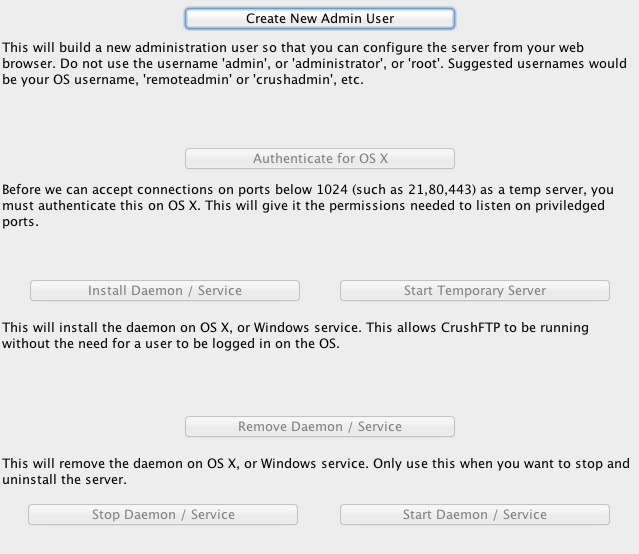 Run CrushFTP 4, and uninstall the daemon or service if its installed. 2.) Copy over your users folder, and prefs.xml file from CrushFTP 4 to your CrushFTP 5 folder. 3.) Optionally, also copy over your stats.xml. 5.) Go to server settings (preferences), and click on each server item. Verify to the right that each port is set to use users from the correct "set" of users. 6.) Test and verify things are working on the new server. 7.) Install the daemon / service again.